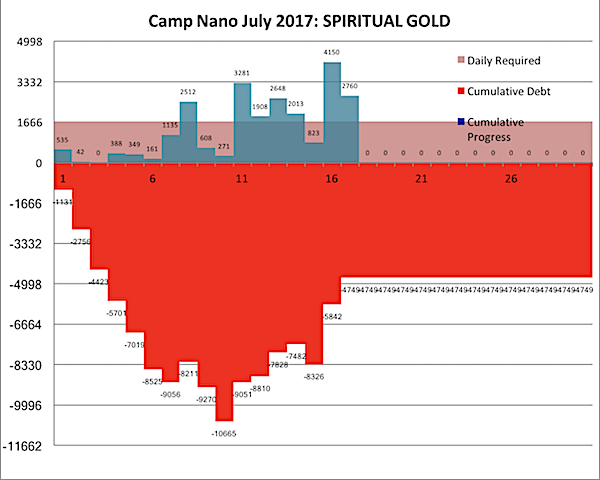 Well, we’re getting ahead of the curve at last on SPIRITUAL GOLD … two days ahead. My writing retreat this weekend has paid off. 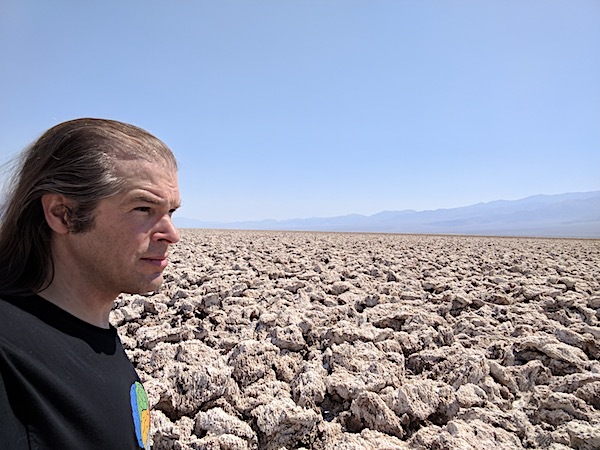 I spent some time hanging out with the Treehouse Writers at the Linde Lane Tea Room in Dixon, California, then holed up in a hotel in downtown Davis, hanging out in bookstores and coffeehouses in an attempt to make some progress on SPIRITUAL GOLD. The actual day of the drive was a wash, but after that, I managed to get more than two days worth of words done in each day, and almost that today. 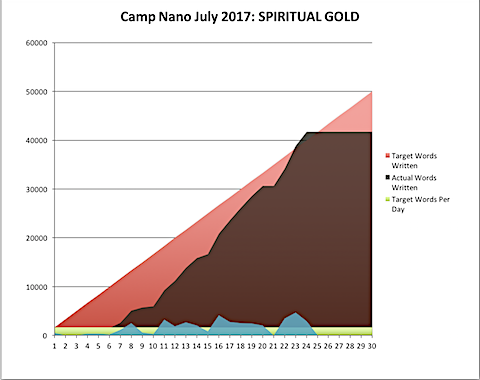 Now at last I’m ahead of the curve, and if I can stay there for a few more days, I’ll win Camp Nano. More importantly, however, I’ve marched forward in the manuscript so I’m around Chapter 37 out of roughly 50, with much of the text of the remainder partially written and merely needing some ironing out. With luck, I’ll finish SPIRITUAL GOLD at the end of the month, and shortly thereafter, and then can begin editing Dakota Frosts #4-#6 together as one big trilogy. 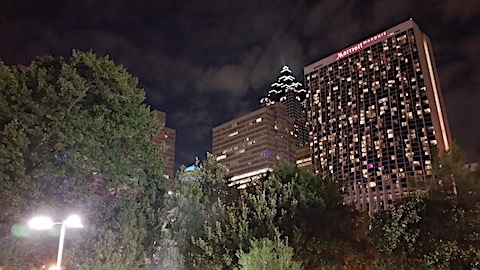 As usual, it takes me some time to get back into a book, especially if I’ve spent the first few days of the month distracted by something like, uh, I dunno, scouting locations for the book. But, now, after about a week of concerted work, I’m getting my legs under me. Blood remains in the water, but it is receding. I sighed, then stared at Heinz. “I … will show you to the showers,” Wilz said. Ten minutes later, I returned from a quick splashdown, holding tight to my body a big, warm, white fuzzy robe provided by Wilz, as Heinz looked at me with quite the smirk. I glared at him, then turned the glare on Wilz, who recoiled in a mix of surprise and curiosity. Wilz took the robe, then drew his hand across his mouth, glancing at Heinz. “And you’re not!” I shot back. “I hope there’s a headrest,” I muttered. The Epsom salt laden water of the tank was warm, thick, almost tacky as I went in. The tank made soft booming noises as I moved, strangely muffled by the outer padding. Wilz helped me straighten out to level, then guided my head down to a horseshoe-shaped rest. The door of the tank closed … and I was left in darkness. 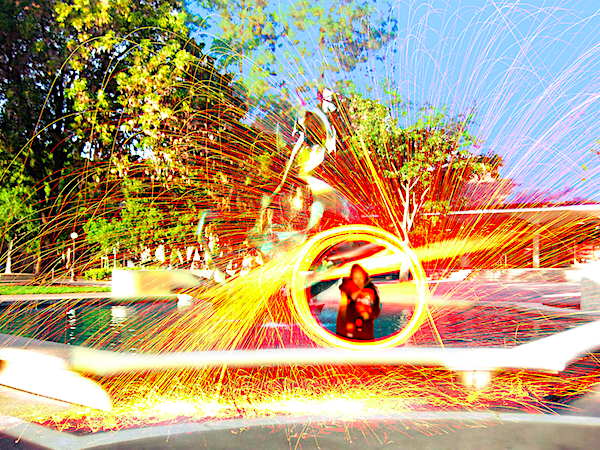 … but it is what I’m using as a cover for my Camp Nanowrimo page for July. 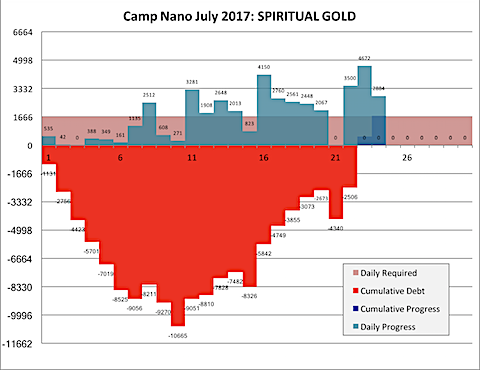 For those not in the know, much of the Dakota Frost series is written during National Novel Writing Month and the related Camp Nanowrimo challenges. For each of these, I take on the challenge of writing 50,000 words in a month. 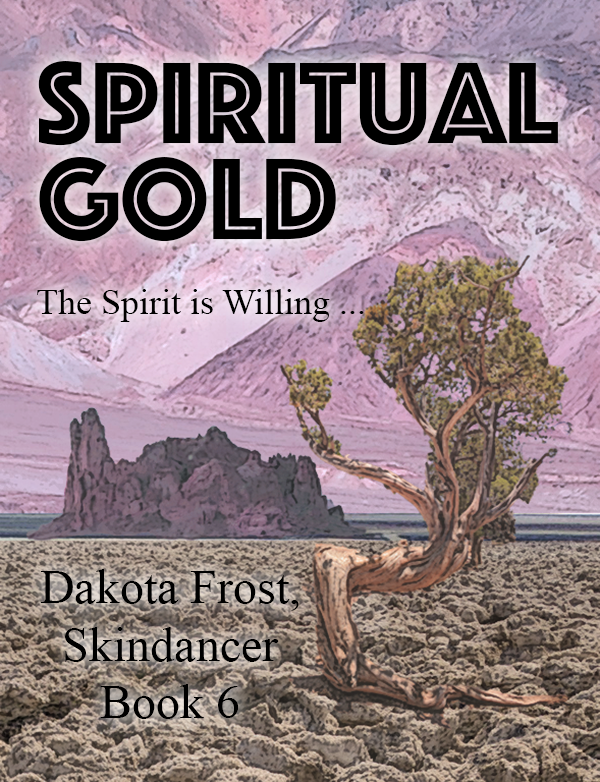 This month, I’m working on Dakota Frost #6, SPIRITUAL GOLD. 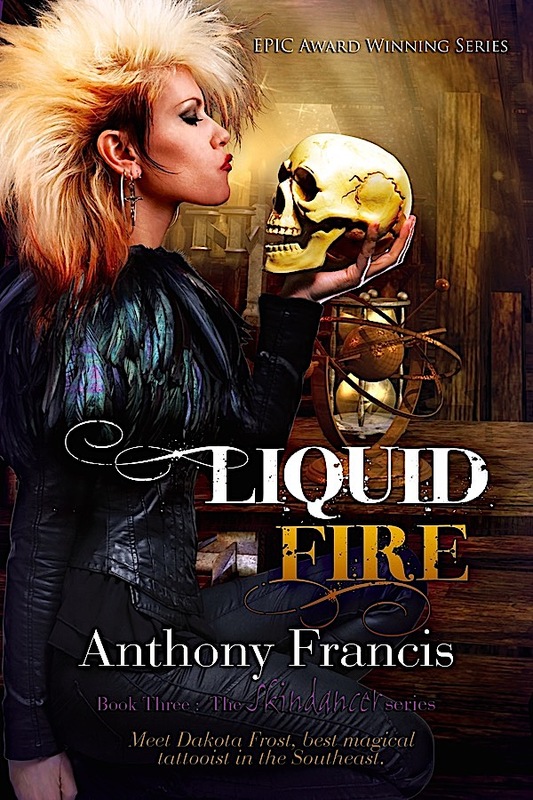 Now, this may seem far away, as the latest Dakota Frost out is, #3, LIQUID FIRE, available wherever fine books are sold. 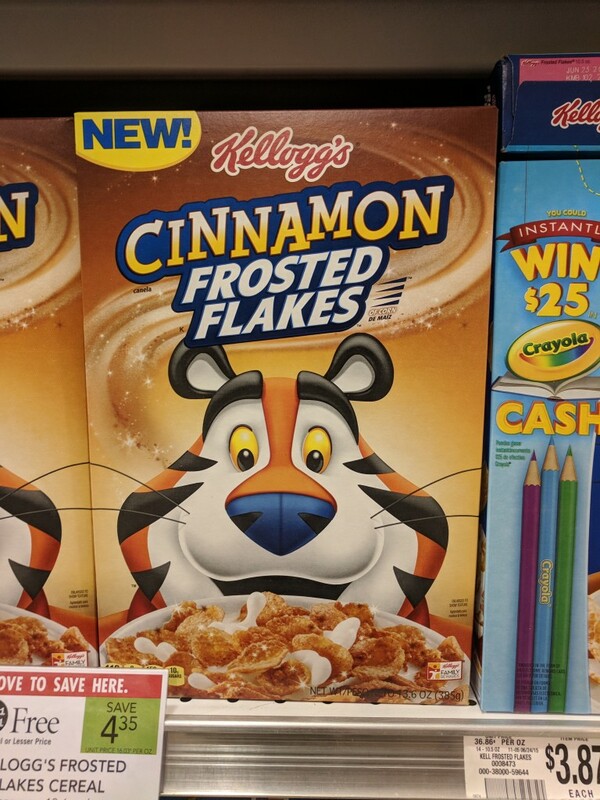 But, to reduce the gap between books – and to increase the coherence between books, I’m writing the next three Dakota Frost books and the first three Cinnamon Frost books together, as one, giant, loosely-connected, six-part novel. 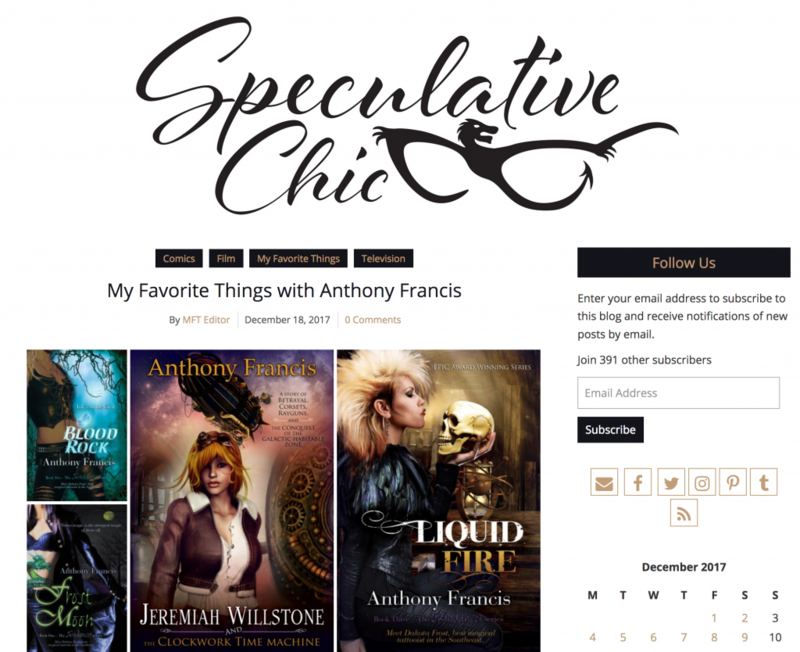 Dakota Frost’s next adventures have the working titles SPECTRAL IRON, PHANTOM SILVER, and SPIRITUAL GOLD. 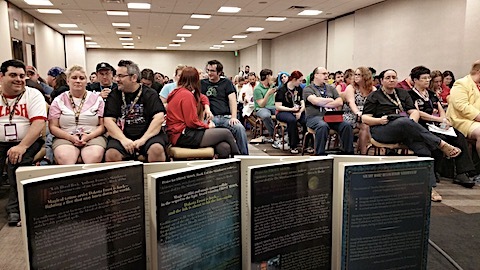 Running just behind each of these will be Cinnamon Frost’s first solo adventures, HEX CODE, BOT NET and ROOT USER. 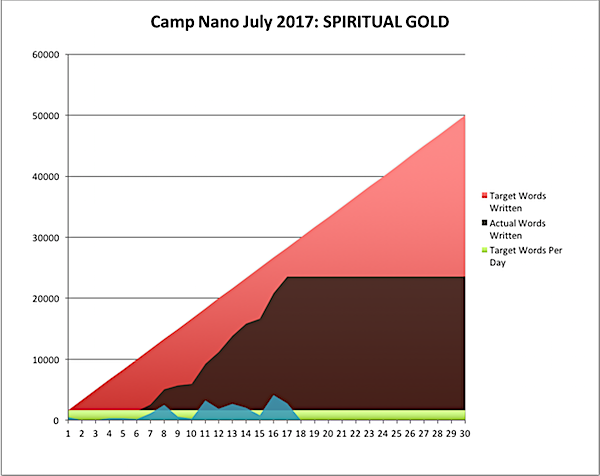 I’ve finished rough drafts of SPECTRAL IRON, PHANTOM SILVER, and HEX CODE, and hope to finish the rough draft of SPIRITUAL GOLD this month. At that point, I’ll start trying to get the Dakota Frost trilogy beaten into shape, even though it will take me two more Nano pushes (at least) to finish up the slightly shorter Cinnamon Frost novels. Regardless, hope to get these in your hands soon. Wish me luck!